Freezing is a quick and convenient method of food preservation you can use to save a large bunch of carrots. While many people recommend blanching carrots before you freeze them, this step isn't necessary. The purpose of blanching is to keep the carrots viable longer in the freezer. You can prepare and freeze unblanched carrots in a matter of minutes. If you use them within three months, you won't sacrifice quality. You must wash the carrots beforehand so you can use them directly from the freezer. Fill a large bowl with a three-to-one mixture of cool water and white vinegar. Submerge the carrots in the mixture and allow them to soak for two minutes to kill any bacteria. Scrub the carrots' exterior under warm, running water to remove remaining dirt and vinegar flavor. Pat the carrots dry with a clean towel to prevent ice crystals. If you prefer, use a vegetable peeler to remove the skin. Remove the tops of the carrots with a sharp knife. Slice the carrots into medallions or dice them into small cubes for freezing. If you're pressed for time, opt for small cubes so that the carrots freeze faster. Spread them in an even layer on a baking sheet and allow them to air-dry for five minutes. Use multiple baking sheets if necessary. Before you place the carrots in their storage container, you must freeze them on the baking sheet so they do not stick together. Clear a space in your freezer and slide the baking sheet in evenly. Allow the carrots to freeze, uncovered, until they are solid. Diced carrots should take around 45 minutes and medallions around 90 minutes. Transfer the carrots from the baking sheet into a plastic sandwich bag and press all the air out. Seal the bag and place the carrots in the freezer. The unblanched frozen carrots work best in stews, soups and mashed dishes. They have a softer texture than fresh carrots. 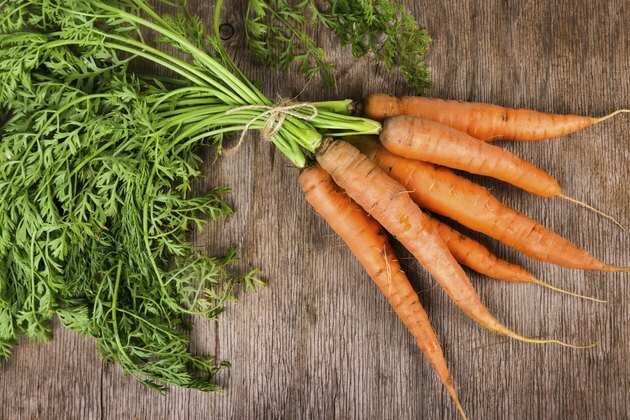 To prevent flavor and color degradation, use the unblanched carrots within three months of freezing. The longer they remain frozen, the more their quality deteriorates. To thaw the carrots, place them in the refrigerator for 24 to 48 hours.